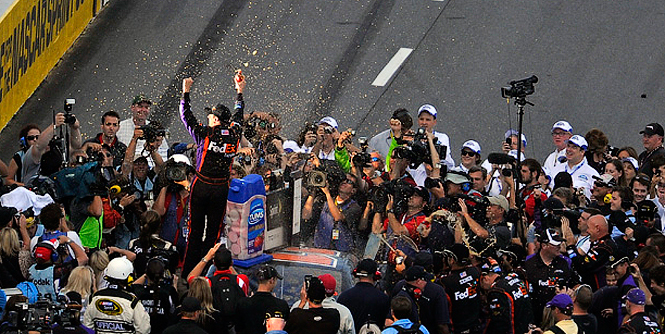 Denny Hamlin captured his 4th Martinsville victory in style for his first win in the 2010 Chase for the Championship. Denny set a goal this weekend, to win the pole, lead every lap, and win the race. Denny won the pole, and the race but unfortunately didn’t lead every lap due to tires problems early in the race. Denny started the race on the pole and led the first 10 laps. Unfortunately Denny would fall far from the lead after the LR tire started having problems. Mike Ford commented that the LR tire had much more build up the anticipated over the LF, which in turn took away all Denny’s stagger and made the car extremely tight. After some hard work from both Denny and his pit crew, they made it back to the front around lap 300. At the beginning of the run Denny was instructed to save fuel. Luckily some cautions saved Denny so they wouldn’t have to pit again, and they could get the long green flag run that they had been looking for. Denny commented that the car was tight at the beginning of the run, but after the tires built air pressure he would be ok.
Denny patiently waited in the 3rd position and saved his equipment while Burton and Harvick started to fade away. With 30 or so to go, Denny made the pass around race leader Kevin Harvick and drove straight to the win. A caution might have killed Denny’s chances with some hard charging cars behind him. There were 4 incidents where drivers blew tires etc. where Nascar could have throw a caution. But it looked like Nascar was on Denny’s side today and indeed wanted the gap to close between him and Jimmy. This should for sure help TV Ratings. Denny had an amazing day and stuck to his word for his 15th Career win.